Supi, celibacy is going to disappear,and you can marry me – or? German Catholics have long manifested a discontent with clerical celibacy. One of Luther’s first acts was to abolish clerical celibacy; Germans currently criticize Zwangszölibat, compulsory celibacy, forced celibacy. As Cardinal Brandmüller points out, the term Zwangszölibat misrepresents the discipline; no one is forced to be celibate. 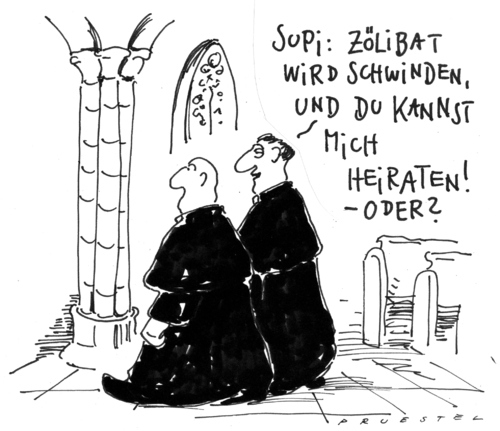 Now a third of German theologians have come out asking for an end to clerical celibacy (and also demanding women priests and the acceptance of gay couples and divorced and remarried couples while we’re at it). The appeal, published in newspaper Sueddeutsche Zeitung’s Friday edition, called on the church’s leadership to stop excluding gay couples and remarried Christians. “The Church also needs married priests and women holding positions in the clergy,” the appeal said—in clear defiance of the Vatican’s dogmas. In Germany theologians need the Vatican’s approval to hold chairs of Catholic theology, so this situatSupim cleibacy is going to disappear,a nd oyu can marry me, or…ion is ripe for conflict. Josef Ratzinger himself at one time had asked for a discussion of the possibility of married priests. The background of this conflict is the tension between German (and other national) Catholicisms and ultramontane Catholicism espoused by the Vatican, and behind that at least in part are conflicting images of masculinity: the one that sees sexual expression as an almost universal, necessary, and good aspect of masculinity and the other that sees celibacy as an expression of masculine self-discipline. During the Kulturkampf in German (c. 1875) the Catholic Church was attacked as feminized and perverse. This accusation stung Catholic men, and a reform group in Munich, the Krausgesellschaft, arose which tried to show that masculinity and Catholicism were compatible. One of the aims of this group was the end of clerical celibacy, because it kept young men with healthy drives out of the priesthood and let in perverse types such as were exposed in a series of scandals around 1900 – scandals which turned out to be baseless. Furthermore, celibacy kept these healthy young German men from reproducing, and degenerate types, many of these Catholic reformers went on to say, were reproducing, and they should be sterilized. And German priests should produce German children because the Aryan race was the purest and most important race and the Jews were polluting it and… I think you can see where this ended up. Historians have been puzzled why Nazism arose in Munich; later of course the conflict between Nazism and the Catholic Church was bitter, but at the beginning Catholic reformers – and remember, these were reformers – were espousing naturalist and racial theories in Munich. The young Heinrich Himmler was a pious Catholic university student in Munich. This is not to say that the current crop of German reformers are racialists or Nazis, but the Vatican has a long memory, and suspects with justice that demands for a change in the discipline of clerical celibacy often lead to demands for radical changes in Christian doctrine. The theologians who coupled a demand for the end to clerical celibacy with a demand for the acceptance of homosexual couples have simply strengthened the Vatican’s determination not to make any major changes in the discipline of celibacy at this time.